The anticipation is ratcheting up for one of this summer's biggest action-adventure events, Hellboy II: The Golden Army, and Dark Horse is taking you behind the scenes! As we delved into the original box-office hit, this 224-page tome likewise presents the most extensive look into the film's evolution, from early concept art and diary sketches to photos of the final props, sets, and filming. A unique look at filmmaking and the art of graphic novels. Guillermo del Toro and Hellboy creator Mike Mignola once again bring their world-renowned talents to bear on a brand-new chapter in Hellboy's history--a visual feast only they could produce. Get your sneak peek well before the celluloid hits the screen! 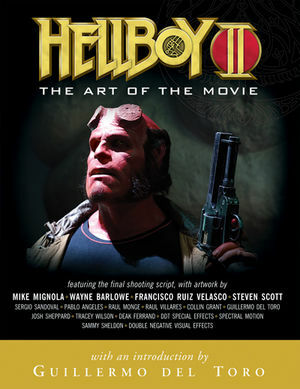 * Guillermo del Toro's (Hellboy, Pan's Labyrinth) complete screenplay including a deleted scene--is featured in this book and is illustrated with the original storyboards. * Interviews and commentary from creator Mike Mignola and filmmaker Guillermo del Toro!